Is ExxonMobil Really Falling Behind Its Big Oil Peers? The oil giant's most recent earnings report wasn't great, but this could just be a short-term lull. With oil prices on the rise, there was a lot of optimism headed into the fourth quarter for oil and gas producers. Then, ExxonMobil (NYSE:XOM) released its results and squashed some of those positive vibes. 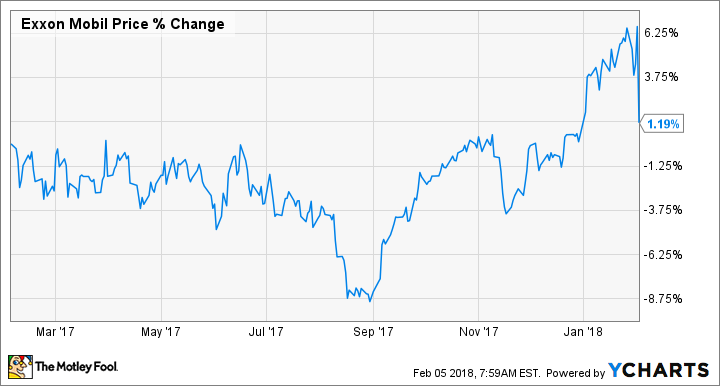 Despite oil prices rising to more than $65 a barrel for most of the quarter, ExxonMobil's adjusted earnings came in strangely lower than this time last year. Let's sift through the company's most recent results to see what happened in the quarter. Data source: ExxonMobil earnings release. Of course, ExxonMobil's performance wasn't quite as strong as that net income result might suggest because the company received a large gift from Uncle Sam in the form of a tax cut that lowered the company's deferred tax liabilities by $5.9 billion. Management also used that large one-time gain as a way to make about $1.3 billion in asset impairments seem much more palatable to investors. If we were to strip out the one-time gains and charges, net income for the quarter would have been $3.7 billion compared to $3.8 billion this time last year. Two things changed significantly this past quarter: Upstream operating earnings gained about $1 billion while refining income declined $600 million. Both of these drastic changes can be attributed to the rapid increase in Brent oil prices -- the international benchmark price -- in the fourth quarter. Since changes in price for refined products tend to lag crude prices a little, a rapid increase in crude can quickly eat into margins. Data source: ExxonMobil earnings release. Chart by author. *Adjusted to exclude the impact of U.S. tax changes and asset impairments. Total oil and gas production increased 2.5% to 3.98 million barrels of oil equivalent per day. Compared to the prior year, though, that is a modest drop mostly related to natural decline at existing assets not being fully offset by new production. ExxonMobil announced first oil production at its Hebron offshore platform off Canada's East Coast and the Odoptu project in Eastern Siberia. The two projects should ramp up to 150,000 and 65,000 barrels per day, respectively. In what seems to be a new quarterly trend, the company announced a sixth high-quality oil discovery off the coast of Guyana. This well, known as Ranger, hit 230 feet of oil-bearing rock, but potential reserves have not yet been disclosed. With the previous five discoveries in this particular offshore block, ExxonMobil has increased its recoverable reserve estimate to 3.2 billion barrels of oil equivalent and expects to drill another six exploratory wells in 2018 and 2019. It also announced a discovery off the coast of Papua New Guinea that should help support the expansion of its Papua New Guinea LNG export facility. On top of closing previously announced acquisitions in Brazil and Mozambique, management also said it had acquired new exploratory acreage in Ghana and Mauritania. In response to a shareholder vote last year, management released its first annual energy and carbon outlook to assess the future risk to the company related to climate change and potential carbon regulations. While the outlook says that global oil consumption will decline between now and 2040, it expects natural gas to grow significantly to offset coal and meet growing energy demand. I certainly acknowledge the drop that we've seen in the upstream business and the return on capital employed. And I think we're going to lay out a growth plan that's going to demonstrate where we're heading, not only to enhance the upstream return but furthermore continue to build in the downstream and chemical businesses, which I think you recognize are very important to the corporation as a whole given our integrated business model. It seems as though this rough patch couldn't come at a worse time for ExxonMobil. There have been some concerns about its upstream production for the past year or so, and this report of declining production and lower rates of return aren't great when its largest competitor, Royal Dutch Shell, has shown its investors a clear vision of its future and is backing those plans up with significant increases in earnings and free cash flow. Woodbury noted on the conference call that it intends to present a more defined plan for growth and better profitability during its analyst day presentation in March. So it's entirely possible that investor sentiment will change in a month or so. After all, its Permian Basin assets and the growing Guyana project suggest it has some incredibly lucrative projects to develop over the next several years that could turn things around by the end of the decade.